RPAU: Hey, it’s great to see you again. Rob’s Bike (RB) : The pleasure is all mine. Thanks for taking an interest in me. RPAU: As you’re no doubt aware, Rob has a few fans out there. We know they’d be interested in a quick update from His Bike. So, how have you been? RB: I’ve been great. I miss Rob, of course. It’s been nearly two years since we parted company, but not a day goes by when I don’t think about him and all the fun we had together. RB: Luckily for Rob, my lips are sealed. I think that’s what he loved most about me. I was a very quiet companion, so he could get lost in his thoughts when he was with me. RPAU: So, tell us what’s been happening these last couple of years. RB: Well, when Rob finished filming The Rover and had to leave Oz, we thought it best that I stay behind, so long as I was left in good hands. He decided to help his friends at the Royal Flying Doctor Service, in Marree, raise some much-needed funds, by auctioning me off. Fortunately, Rob knows that any true fan of his would look after me, as if I was her own. … So, early last year, I was successfully auctioned for the RFDS and found myself on my way to a lovely warm, tropical climate, which I’m still enjoying to this very day. RPAU: So, you’re being treated well? I have my own room with a nice view. My new owner is always checking up on me, making sure I’m safe. (Sometimes it seems a little excessive, her concern. But hey, I’m a bike, so I keep quiet.) I’m kept meticulously clean. Well, except for the water bottle, which for some reason, she refuses to wash. I occasionally hear her mutter “just in case”, but I have no idea what she eans by that. RFDS actually managed to track down Rob in New York and have my seat signed last year, so my lovely owner refuses to let ANYONE ride me. Every now and then, I hear a pesty male voice threatening to take me out for a ride. The only response I ever hear is “Over my dead body and divorce papers!”. I sometimes think she thinks I belong in the Smithsonian, next to Dorothy’s ruby slippers. Maybe one day. RPAU: Wow, thanks so much for your time. Rob’s fans will appreciate the update. RB: You’re welcome. You got me on a talkative day. RPAU: Any chance we could grab a pic or two to go with our interview? I bet those doors are always open lol. Even I’m not able to go out for a ride on Rob’s bike and believe me I’ve suggested to Rob’s Benefactor that she would be able to recoup the money donated (or donate even more) in a flash if she charged for a little peddle or two. Joking aside, even though Rob’s Benefactor now has Rob’s bike as a bonus, noone can deny that it was an amazingly generous donation to a worthy cause. Below is the letter of authenticity and the photos. I can’t remember if I mentioned to Liz that I knew who bought the bike. I remember telling someone – maybe David. If reposting please source and credit RPAustralia. Sending waves of happy to Rob’s bike and Thanks for the update. Such a win win – great cause and blessed to be hanging out in a good home with good people. I have such a massive grin on my face right now!! That was so priceless!! Thank you so much Rob’s Benefactor for the giggles…. You know us too well, it was brilliant to hear how Rob’s bike is getting on. I’m so glad he’s being so well looked after 😁👍 I’m still chuckling at the “over my dead body and divorce papers” LOL!! I can’t thank you enough, this was truly brilliant and thank you so SO much for being so generous in Rob’s name. Such a fantastic cause. I thoroughly enjoyed this article about Rob’s Bike. It was informative and SO humorous! The bit about never cleaning the water bottle had me chuckling out loud. Thanks for posting the story and photos! I really enjoyed reading all about Rob’s bike. So glad it has gone to a good home. 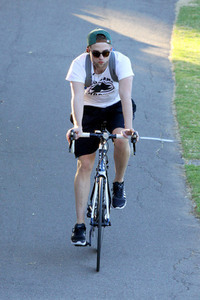 Nothing quite like a Talking Bike, especially one that once belonged to Rob LOL! LOVE this post so much & the interview made me smile so wide 😀 What a fantastic cause, thank you Rob’s Benefactor for your generosity & for sharing with us. Love that the bike has gone to such a good, loving home & is having fun *giggles*. I know @Sue I know! Rob’s Benefactor – This is bloody awesome. The Bike has it’s own room? You crack me up. Seriously, this was a wonderful thing you did. The RFDS is such a great cause and The Bike is going to a home, where at least one of it’s members, will ensure it is treated with the reverence that is it’s due. I love the interview Maria. You really are the seasoned pro.